Corn in Hawaii. Image courtesy CTAHR LIFE program. A new analysis of corn production in the American Midwest has determined that today's crop yields are more sensitive than ever to bad weather, and especially to drought conditions anticipated under likely climate change scenarios. The study published in May in the journal Science was led by a Stanford University earth scientist and co-authored by Associate Professor of Economics Michael J. Roberts in the College of Social Sciences at the University of Hawai'i at Mānoa. "The Corn Belt is phenomenally productive," said David Lobell, an associate professor of environmental Earth system science at Stanford University. "But in the past two decades we saw very small yield gains in non-irrigated corn under the hottest conditions. This suggests farmers may be pushing the limits of what's possible under these conditions." "A lot of agricultural research has been designed, at least in part, to improve performance during drought," said UH Mānoa's Roberts. "However, even as individual plants may become more drought tolerant, that doesn't tell you what happens at a larger scale. Farmers adjust seeding rates and planting times to take advantage of new traits, which can also factor into drought sensitivity." To conduct their analysis, researchers combined field-level records of soybean and maize (corn) sowing and crop yields collected by the U.S. Department of Agriculture with high-resolution daily weather data. They considered four weather variables: minimum and maximum daily temperatures, precipitation, and the daytime vapor pressure deficit or VPD. The study included more than 1 million records for crops grown across Iowa, Illinois and Indiana between 1995 and 2012. The researchers found that over time, crops have become more vulnerable to changes in VPD, which measures aridity, a key indicator of drought that is closely linked to extreme heat in the Midwest. 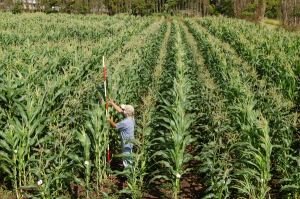 The effects were much stronger for corn than for soybeans, a result that the authors believe may be tied to how densely corn is sown. Recent technological advancements have developed corn plants with stronger, more efficient root systems – allowing for tighter sowing – but densely planted corn can suffer higher stress during periods of drought and thus produce lower yields. The researchers predict that at current levels of temperature sensitivity, crops could lose 15 percent of their yield within 50 years, or as much as 30 percent if crops continue the trend of becoming more sensitive over time. "In fact, if this trend in drought sensitivity continues the impacts of climate change could be twice as bad as most people predict for this region," Roberts said. "The key thing to recognize is that greater drought tolerance may come at a cost of lower yield potential, possibly giving up some historic productivity gains." Corn is the primary seed crop grown in Hawai'i, according to the Hawai'i Crop Improvement Association. The United States produces about 40 percent of global corn, and 35 percent of global soy. More than 80 percent of U.S. corn is grown without special irrigation (rain-fed only).